Everybody seems to be moving a touch bit faster now that the cold weather has arrived. People bundled in winter coats and scarves, dodging in and out of store fronts and bustling down the subway stairs hoping the next train is coming up the track. November can be a month that brings assorted weather. But yesterday afternoon, it was nothing but cold with snow flurries. I snapped this photo while running into the grocery store. As I was walking in, I became very much aware of the ‘movement’ around me. We all had that the same skip in our step. Moving quickly to avoid the cold. Noticing this, I grabbed my iphone from my pocket and photographed the moment. I had fun with this edit. I cropped to a 16:9 size and sharpened in Snapseed. Then I applied the motion effect in Dynamic Light, which not only blurred the photo, but also brightened the reds and blues. 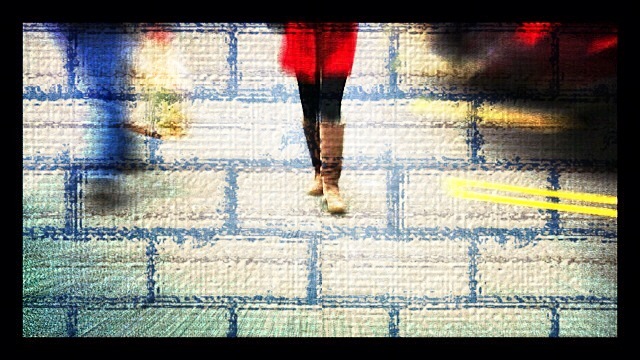 I could have stopped there, but I was having too much fun, so I decided to add a large brick overlay found in the Photo Shop Express app. This added some interest to what was originally a boring asphalt parking lot. I lost a bit of the motion effect by doing so, but I really like the edition of the brick. To finish, I framed with a thick black frame in pixlromatic. I really enjoyed this challenge. It forced me to stop in the midst of a lot of movement, and find art in what was going on around me. With all honesty, I can’t say that I enjoyed this day of the challenge as much as I thought I would. I take lots of pictures at my kids’ sports activities, namely swimming, soccer, and football. So I thought that snapping a shot of ‘motion’ would be a breeze. It then occurred to me, the purpose probably wasn’t to freeze motion, but instead to convey it. This would then require a slow shutter speed, rather than a fast one, to show movement rather than to freeze it. I had some great shots taken back in March, when my family went to New York, and I took photos of taxis driving past us in the streets at night. Oh, how I would’ve loved to have cheated and used one of those pictures here! Instead, Ella was a great sport and went round and round our cul de sac on her bike, listening to me yell “Just one more time!” over and over again. It was 5 o’clock in the afternoon and as the sun goes down behind our house, the street was just about in the shade. 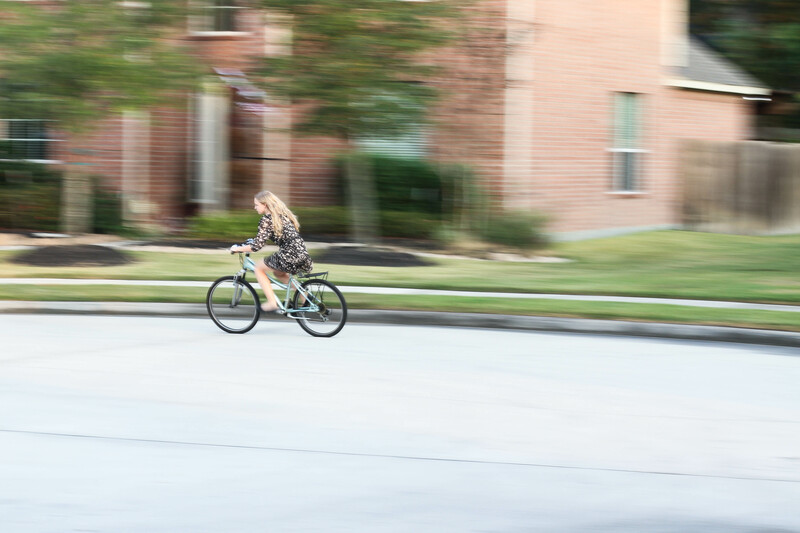 My aim was to use a slow shutter speed and, while focusing on Ella, to follow the forward motion of the bike by moving my camera in the same direction. It was still very bright outside, so I set my ISO at 100. To compensate for the slow shutter speed of 1/15 that I was using, which will let in a lot of light, I reduced the aperture to f/9.0, otherwise the image would have been over exposed. I’m not sure that I’m 100% pleased with the resulting picture, but I think that Ella is still the main focus of the shot, and that motion is conveyed in the background and well as in her pedaling legs. In Lightroom 4 post-processing, I initially cropped the image using the rule of thirds, so that Ella is on the line of the left third. I increased the contrast, and decreased the shadows and black clipping, then increased the clarity, vibrance, and saturation. Finally, I sharpened the image and smoothed the luminance. Very cool!!! I need a tutorial on using my iPhone apparently….